Cauliflower is one of those highly underrated vegetables. It’s not super pretty to look at, it tastes pretty bland when just steamed, but try roasting this baby and it’s a whole new ball game. I’ll be honest, I never liked cauliflower as a kid – it just looked unappetizing, never mind the actual taste. Lucky for me, my mom wasn’t a huge fan of it either, so it didn’t turn up on the dinner plate too often. I ate broccoli, peas, asparagus and other veggies and managed not to get scurvy or any other vitamin deficiencies growing up. Then, a year or so ago, I got an email from her extolling the virtues of cauliflower. Really?? I didn’t believe her at first, but after a visit home where she served roasted cauliflower, I was converted into a believer. So, I wanted to share my epiphany with you. Yes, indeed. Cauliflower can be a tasty side dish after all – if you dress it right and roast it. After tasting this recipe for balsamic roasted cauliflower, I bet you’ll be a convert too. It really is something else. Preheat over to 425 degrees Fahrenheit. Combine olive oil, balsamic vinegar and garlic in a bowl. Add cauliflower florets to bowl and toss to coat the cauliflower. Place tinfoil in the bottom of a baking dish (I use a 2-quart Pyrex glass baking dish) and pour cauliflower florets and any additional liquid into dish. (The tinfoil makes clean up afterwards much easier). Sprinkle cauliflower with salt and pepper and mix with a spoon. Place baking dish in the oven for 45 minutes. Stir cauliflower halfway through and add a little more balsamic vinegar if it seems to need it. Remove, give one more stir and plate and serve with entree. 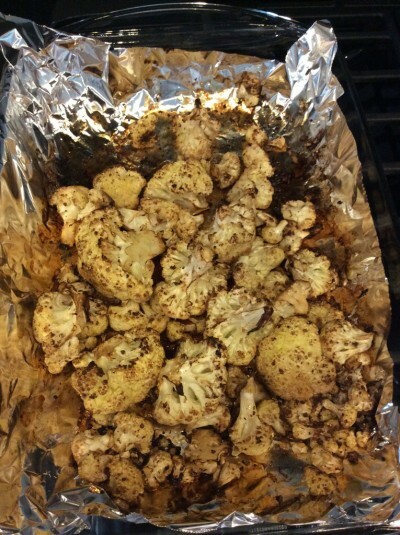 Balsamic roasted cauliflower fresh from the oven. The aluminum foil makes clean up a whole lot easier. This entry was posted in Recipes, Side Dishes and tagged Balsamic, Cauliflower, Garlic, Recipes, Roasted, Roasted Cauliflower, Side Dishes on June 25, 2014 by Paige N..